Planning of service realization procedure is a systematic process to ensure the all the production and service realization activities are performing as per standard requirements. Management is responsible for assigning responsibility to a project manager or design engineer for the quality planning for new services, processes or projects. Design engineers are responsible for completing a design project according to the Design and Development procedure. The project manager is responsible for completing a quality-planning table. In order to develop and produce a new product that meets the customer’s quality requirements, systematic advance quality planning is require. The Advance Product Quality Planning procedure accompanies the development of a product and is intend. To ensure that the supplier meets all of the customer’s requirements on time. The supplier is fully responsible for the timely planning, execution and documentation of all activities carry out within the framework of Product Quality Planning. Specifies persons in his organization who are responsible for the individual activities and stipulates the corresponding deadlines. On the customer’s side, the technical departments (depending on their area of responsibility) or designate project supervisors are responsible for cooperation with the supplier. In order that development activities can be carry out, it is necessary to define the targets for the project and the communication channels between the parties involve (customer, supplier and subcontractors). To ensure continuous monitoring of the project and adherence to the deadlines specify by the customer, the supplier must set milestones at which the define activities must be complete. The quality objectives or expect requirements for the service, process or project. The project manager investigates and completes each applicable section of the quality-planning table. The project manager assigns responsibility and timelines for preparing documentation and implementing processes. When the project has been complete, management reviews will be conducts. 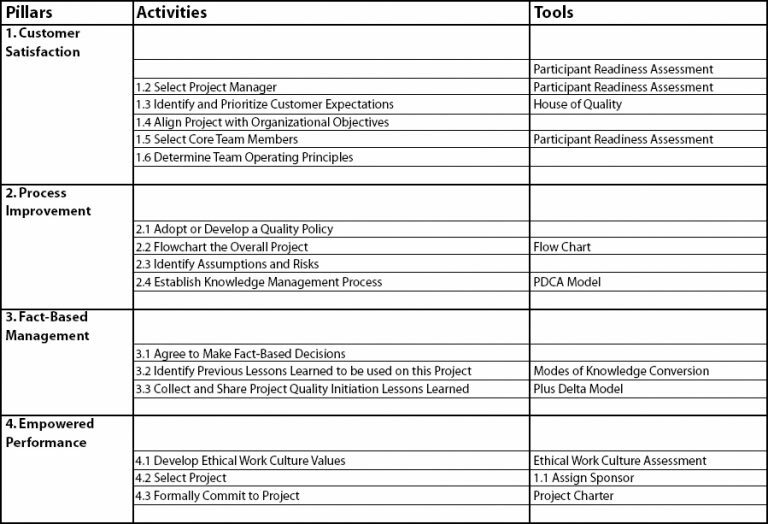 The quality planning table can use to make sure, that all requirements have been met. Even and signs to indicate approval. Processes (from customer input through delivery and service) that lead to the creation of the final surveillance, inspection, audit or engineering service. Planning of services or processes to transform a set of requirements into a service realization process. As new services, processes or projects are introduce, quality objectives and product requirements are determine as appropriate. Management assigns responsibility to initiate a quality-planning table or design project. Design projects are conduct according to the Design and Development Procedure. The project manager initiates quality-planning tables.